According to the most recent data available from the US Bureau of Labor Statistics, 21% of the workforce has been at their current job for one year or less. That means that one in five professionals recently went through some sort of onboarding process (or are going through one now). The quality and execution of this introductory program can have a major impact on an employee’s ability to assimilate to your company’s policies, procedures, and culture. Use these tips to help your new hires hit the ground running! 1. Don’t try to do too much at once: In a misguided effort to save time, many companies choose to combine their orientation and onboarding processes. Even for lower-level roles, this rarely proves to be an effective strategy. It’s too easy for it to become an overwhelming experience. Design your orientation to be a basic primer on the company itself, including its employees, buildings, primary policies, and key equipment. Onboarding needs to be much more in depth and entirely focused on the duties and responsibilities that individual was hired to perform. 2. Keep it simple and don’t rush: The first few days (and weeks) of a different position can be head spinning – there’s so much information to take in to become acclimated to an unfamiliar workspace. 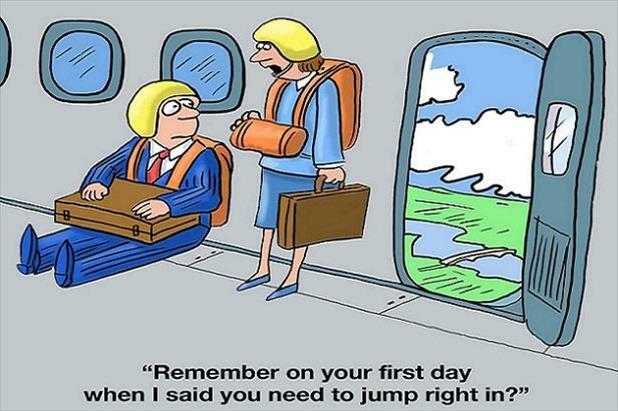 Don’t make it worse by subjecting a new hire to an overly complicated onboarding process. Take into account the speed at which the individual is able to absorb the material you are providing and don’t mistake haste for efficiency. Since this is someone who will (ostensibly) be with the company for quite some time, there is no need to hurry through vital information. Many experts recommend dedicating anywhere from three months to one year to onboard an employee depending upon their position/experience level. 3. Customize the process: Standardized onboarding plans are incredibly appealing. It’s tempting to develop a single program and call it a day, but that could turn into wasted effort and require additional training down the road. While it’s appropriate to create a fairly uniform orientation process, onboarding must be modified based on the strengths and weaknesses of each fresh hire. Is your newest staff member a visual, auditory, or kinesthetic learner? Do they prefer to work individually or in a group setting? These are important questions to consider when tailoring your onboarding program. Similarly, it may be tempting to do a bulk onboarding. This is also not a great idea, as it makes it impossible to cater to each individual and will most likely require the process to be delayed for some team members and expedited for others. Worse still, you could end up having to repeat the process completely. 4. Get your new hire involved: No one likes to sit through a boring lecture or watch a cheesy introductory video, so toss out those old-fashioned, clichéd materials and devise a process that makes the new hire an active participant rather than a bystander. Consider building a dedicated site complete with games, quizzes, and other fun elements to teach the individual some of the basics while keeping them engaged and entertained. Establish a mentor program and match rookies with veterans to show them the ropes. This is most effective if the mentor-mentee work in the same department (even better if they’re on the same team). 5. Make it a social experience: Incorporating social media into your onboarding process can be a great strategy, but you should also make in-person introductions to help your new employee build rapport with some of the coworkers they will be supporting and collaborating with in the near future. In addition to bringing these team members together, you can also encourage further networking within the company. For instance, IBM suggests that recent hires join “interest communities” to make like-minded contacts and become further integrated in their corporate culture. Another approach would be to have the new hire shadow members of different teams or even participate on interdepartmental task forces. This will enable them to meet professionals from a variety of areas while contributing to a special project or initiative. 6. Use metrics and hold new hires accountable: All fresh employees deserve a certain grace period to become acclimated to their role and comfortable in their position. However, it’s important to gauge how they’re progressing and whether they’re the right fit for the department or company as a whole. Create a standardized evaluation system to determine if an individual is on the right track or needs additional attention. By conducting regular assessments, you will also be able to identify how your onboarding process is working and make changes if needed. Once the initial orientation period has passed, consider scheduling monthly or quarterly meetings to check in with recruits and get their feedback about their own performance. These comments combined with the opinions of their peers and supervisors will indicate if they are truly a good fit with the company and settling into their role as expected. 7. Provide positive reinforcement and show your interest/appreciation: Maximize your new hire’s success (as well as your own) by recognizing them for their progress, improvement, and achievements. We’ve all been the new kid at some point in our lives, so it’s important that you make them feel welcome and enable them to thrive in their role. If your trainee is quickly getting up to speed, let them know. Don’t be shy about saying “thank you” or “nice job” and avoid only reaching out if they appear to be struggling. Check in frequently even after the “honeymoon” period is over. Discuss their career goals and professional development opportunities. Showing a sincere interest in them as an individual and an employee will go a long way to cultivating a strong, lasting relationship.